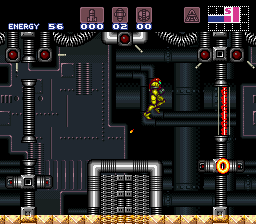 SNES Super Metroid (JPN/USA) "X-Ray glitch" in 21:25.12 by cpadolf. With the use of the X-Ray Scope to get out of the rooms' bounds, some non-trivial physics abuse, and esoteric RAM data manipulation via dying in a certain room, the amount of tasks Samus usually has on Zebes has been cut to almost nothing. No boss is ever fought in this TAS, and even Mother Brain is skipped completely. The in-game completion time is 00:12, and only 6% of the items are collected, making this the lowest legitimate percent completion ever achieved. This is an improvement of 10.44 seconds real-time, or 2.38 seconds in-game, over the previous run of this category. If you thought this was fast, check out the run that beats the game even faster using the glitchy charged Space/Time Beam.